Here’s a real-life example of how to crowdsource a conference program in real-time. 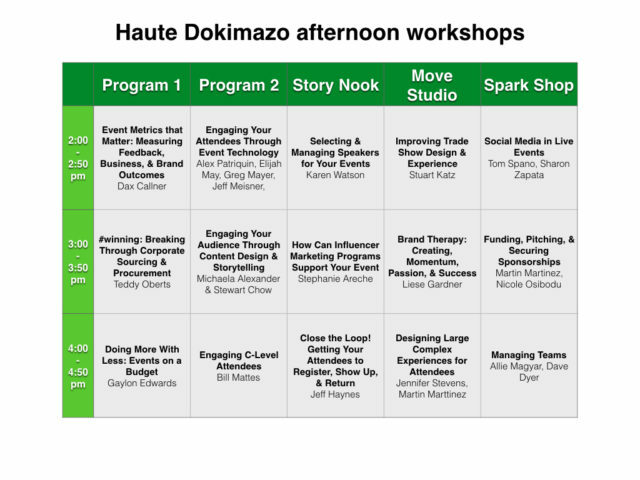 In May 2017 Liz Lathan, Tom Spano, and Nicole Osibodu invited me to design and facilitate the session crowdsourcing at the first Haute Dokimazo unconference in Austin, Texas. 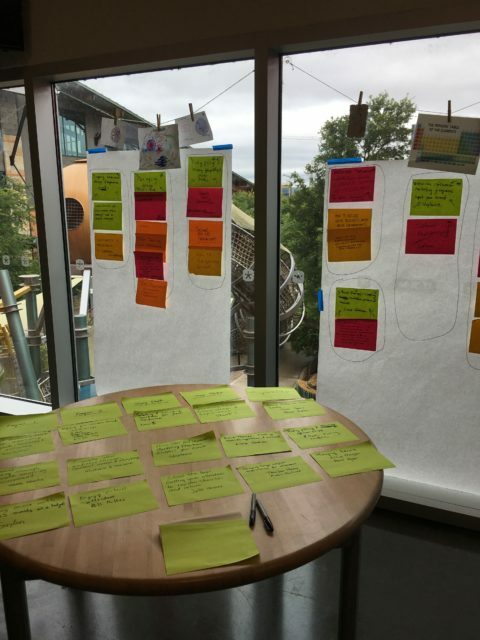 Eighty invited participants from around the U.S. spent a joyful and productive day at the Austin Children’s Museum’s Thinkery where we crowdsourced a program focusing on event portfolio needs and wants of brands and agencies. Watch this three-minute video for a taste of the event — then read on to learn how we crowdsourced the program. Every peer conference has an arc that includes and integrates three elements: a beginning, middle (the program itself), and end (reflecting, evaluating, and developing individual and group outcomes & next steps). The beginning is when crowdsourcing takes place, and before crowdsourcing it’s critical that participants get to learn about each other as much as possible in the time available. The best way I know to support initial inter-participant learning and connection is The Three Questions process I devised in 1995 (see my books for full details). After quickly introducing and having the group commit to six agreements to follow at the event, we had forty-five minutes available for The Three Questions. To ensure each person had time to share, we split the participants into four equal sized groups, each led by facilitators I had trained the previous evening. Once group members had learned about each other, we reconvened to crowdsource the afternoon program. Crowdsourcing took just 25 minutes. 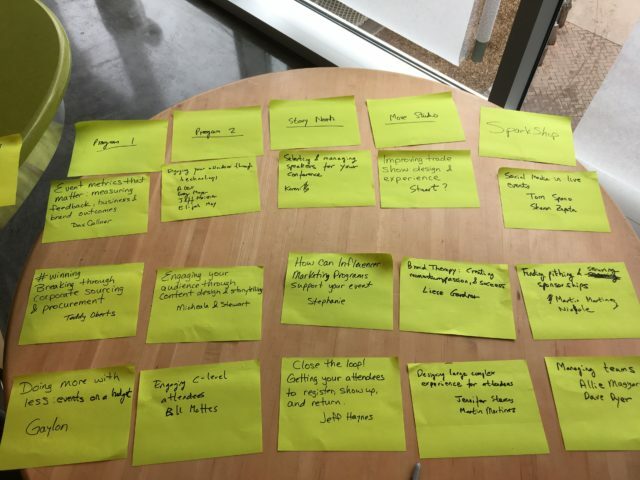 Participants used large colored Post-it™ notes to submit session topics. 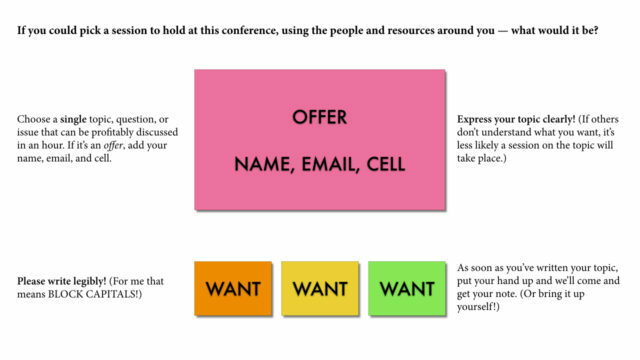 Pink notes were used for offers to facilitate or lead a session, and other colors were used for wants, as explained in the diagram below. …and worked out what we were going to run, who would facilitate or lead each the session, and where it would be held. During lunch we checked that the session leaders we’d chosen were willing and available for the schedule we’d created. Finally, we created a slide of the resulting sessions, added it to the conference app, and projected the afternoon program on a screen in the lunch area. This is just one way to crowdsource a conference program in real-time. Want a comprehensive resource on creating conference programs that become what your attendees actually want and need? My next book The Little Book of Event Crowdsourcing Secrets contains everything you need to know. Learn more, and be informed when it’s published in 2018.